The ISTE EdTech Coaches Network has some great resources for instructional technology specialists. Why do you need an instructional technology specialist? It’s wonderful to have teachers that are excited about using technology in the classroom, but with the increasing importance of blended learning and mobile learning, a few individual teachers with a knack for tech might not be enough. An instructional technology coach can help any teacher, no matter how experienced, to maximize tech tools in the class. Every professional needs to consult colleagues and utilize new resources from time to time, and that is where the ISTE Ed Tech Coaches Network can help your instructional specialist. What is the ISTE EdTech Coaches Network? The ISTE has tons of great resources for keeping your classrooms up to date with the latest EdTech trends. This includes professional learning networks for many different categories of educators including administrators, computing teachers, librarians and so many more. One of these networks is the EdTech Coaches Network, where instructional coaches can come together and share ideas about how to support the educators in their schools in the best and most productive way possible. Having a professional support network allows you to ask the experts when questions arise and benefit from the hard work of others. What are the benefits of having an instructional technology specialist on staff? 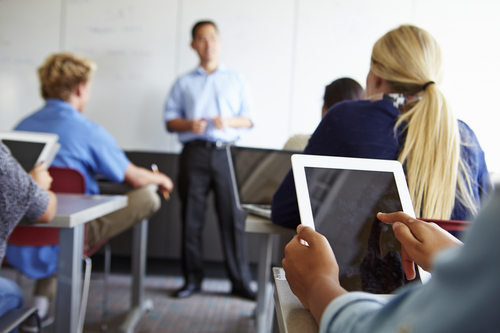 Educational technology specialists help teachers integrate tech into lessons. They do much more than just making sure that the wireless is working and the projector is connected to your laptop. Many teachers spend hours searching for web tools that can enhance their lessons. Rather than spending their own time looking around for resources, they can simply call in the expert, the resident instructional technology specialist. This person is an integral part of the educational faculty, someone who, as an expert, can lead a teacher directly to the best tools in any subject area. The instructional coach builds a coaching relationship with each teacher, empowering educators to use tools themselves and troubleshooting when challenges arise. This can be done through one-on-one training, guest teaching or co-teaching. Bringing the specialist in as a co-teacher is a great way to model collaboration and lifelong learning for your students. Having an instructional coach as a member of your faculty will also show prospective students and parents that your school is serious about 21st century learning. What challenges do EdTech coaches face? Many teachers become defensive when approached by anyone who suggests that their lessons could be improved. Moreover, teachers who are wary of tech are likely to shy away from an instructional technology specialist. One way for specialists to approach this challenge is by starting to work with the teachers who are enthusiastic about bringing more mobile learning into their lessons. Once these educators have successfully utilized new tools with the guidance of the EdTech coach, other teachers will start to notice and want to experience similar success. The more the administration encourages and promotes collaboration with instructional coaches, the more teachers will want to take advantage of their knowledge and expertise. It is important for an instructional specialist to create ongoing relationships, and not just offer quick fixes. By reaching out and asking teachers what they want to do next, they can keep the progress going. Providing small tips that make a dramatic difference can also be a way of earning trust a keeping educators coming back for more. The ISTE EdTech Coaches Network is a great resource for educational technology specialists. Whether you need help finding a specific tool or empowering reluctant teachers, this professional network offers specialized support and tips that can make a big difference. Today’s schools need effective instructional coaches to ensure that all teachers are equipped to prepare students for the future, and providing coaches with the right resources and tools is the best way to ensure that their potential is maximized.